The topic of artificial intelligence is becoming increasingly important in today’s society. In this article, we look into how this could have an impact on web design. Ever since the release of the Gartner study “Surviving the Rise of Smart Machines: The Loss of Dream Jobs and 90% Unemployment” in 2013, there is an increasingly intense discussion about “smart machines”, artificial intelligence (AI), and their impact on companies and our society. This topic has also attracted further attention due to more and more frequent warnings from well-known scientists, such as Stephen Hawking, warning us of the consequences of out-of-control intelligent machines. Even various Hollywood productions, such as “Ex Machina” (see excerpt below) from 2015, in my opinion well worth seeing, and popular books, such as Nicholas Carr’s “The Glass Cage: Where Automation is Taking Us?”, refer more and more to the possible impacts of artificial intelligence. YouTube Video: Hollywood Production “Ex Machina” – Who is the Machine? Smart machines are machines that typically do things usually done by people – tasks never thought to be performed by a machine. Smart machines are capable of learning and using AI methods to act intelligently. Examples of smart machines include software programs in the stock exchange for high frequency trading, self-driving automobiles, or diagnostic systems for tumor detection. 1. Most companies and decision-makers underestimate the potential of smart machines. More precisely: 60% of the decision-makers surveyed by Gartner for the study believe that the emergence of smart machines is a futurist fantasy. At the same time, companies and decision-makers can see that the speed of scientific and technical innovations is greatly increasing. 2. Smart machines do not simply support the automation of simple tasks anymore. Instead they are learning systems that work in a similar way to the human brain. Therefore, smart machines lead to a reduction of jobs that, until now, were thought to be secure. 3. The Gartner study hypothesizes that by 2030, up to 90% (!) of all jobs will be under threat to be replaced by smart machines. By 2023, a third of all doctors, lawyers, and professors/lecturers will have been replaced by smart machines or less qualified people using new assistance systems. The job market, political systems, and society as a whole would have to change immensely to absorb the changes caused by smart machines. At the same time, it is and remains to be (“only”) a dream of the future! Smart machines and AI have also increasingly been discussed lately in the context of online marketing and web design. Facebook is already using artificial intelligence. What’s impressive is that the AI of the Facebook platform makes 6 million predictions or decisions per second, for example, during the selection and provision of content for news feeds, during the user login, or during the recognition of photo content (because users are increasingly posting more photos). Google has also been experimenting intensively with AI and its application possibilities for a long time. Thus, it is only logical that Google also presented many projects using AI methods at its developer’s conference I/O, which just ended. For some time now, the American startup “The Grid” has been causing a furore (see Figure 2), promising no less than a revolution for the design of websites and online shops. The Grid was made available to the public in mid-2016. The founders of The Grid are Dan Tocchini and Brian Axe, both kids from Silicon Valley. Greg Badros, who first worked at Google (as Senior Director) and then at Facebook (as Vice President) taking responsibility for important issues of product development, is now The Grid’s sponsor and consultant. Furthermore, Badros developed major scientific foundations and theoretical procedures for The Grid with the help of the “Cassowary Constraint Solver“. Figure 1: The Grid (screenshot https://thegrid.io). The founders of The Grid focussed on the question of whether web design can become automated. The idea is that users should not have to design and program websites anymore. The only thing that has to be provided by the user is the content (texts, photos, videos), which is then transferred to the AI-based The-Grid-Framework and subsequently transformed into a website. This way, the presentation of the content should not be any more difficult than its creation (or as The Grid formulates it: “The Grid’s sales pitch is that creating a beautiful looking website geared towards your intentions shouldn’t be harder than giving it content-images, videos, and text.”). At its core, The Grid is a website construction kit that uses AI methods to automate and sensibly combine layout and design decisions. The bases of the construction kit are not rigid templates, but rather dynamically changing grids and design patterns (The Grid describes so-called filters, but this term does not really do justice to the whole thing). With the provided content, the AI algorithms “build” a website, meaning they decide how the content will be presented. These decisions include what the layout of the website will look like and which design elements will be used, such as colors or fonts. If photos have been provided to The-Grid-Framework, they will be analyzed and subsequently automatically processed, changing aspects such as their saturation, size, and format. The highlight (at least as it was promised): if new content is supplemented, the design of the website will automatically be adapted. If this were to work, then easy real-time web design would be possible – while also bypassing the mediators used up until now such as Facebook, Instagram, or one’s own CMS. Web design would no longer be a job that requires a lot of time and energy – that time and energy could instead be used for the preparation and provision of content. Hearing this should make every content marketer go nuts! Is The Grid’s Idea Even Feasible? The starting point to answering this question is the realization that good design does not depend on the ideas, experiences, inspirations, and esprit of the designer alone. In the process of designing, fundamental design principles also play an important role. These principles provide the designers with a framework of practice-tested criteria and rules that will help to avoid a bad design from the start. Product video at YouTube:: The Grid – AI Websites That Design Themselves. In the same regard, the popular concepts of design thinking give methodical recommendations to develop real solutions based on actual problems. Thus, The Grid could be seen as a tool that drastically simplifies and solves (via AI) a problem that many people have (designing a website). This means: At least to a certain extent, design can be formalized and can thus be made mathematically processable. Taking the step towards using AI is logical, even though it is not a small step. It is also important to understand that the purpose of The Grid is not to create the world’s best design. Quite the contrary! That will not be what the users demand anyway. To be honest, who hasn’t been slightly annoyed at their smartphone before because Siri is not as clever as we need her to be? This means: Pareto holds true once again! We will need more than AI for the best 20% in design. Nevertheless: In many cases (~ 80%), the design generated by The Grid will be satisfactory. Many websites already work very well, even though their design may not be perfect or ideal. For those that would like to learn more about the technical limitations of The Grid, Ben Moss has written a very interesting and critical analysis. The blog article by Austin Wolf and this review by Jason Vissers also contain interesting and complex discussions on the topic. How Could This Affect Human Web Designers? Inevitably, every innovation leads to a discussion of its suspected negative consequences. Just like it is discussed whether smartphones cause cancer or whether regenerative energy generation leads to nationwide power failures. Typically, these critical objections come from those that have the most to lose if the innovation takes off. In 1934, the US-American writer Upton Sinclair already wrote that people always have difficulty understanding new ideas when their own life and environment is based on old ideas. So, how will the majority of web designers react to The Grid? Probably with skepticism! Because it is the web designers that – at first glance – have the most to lose. 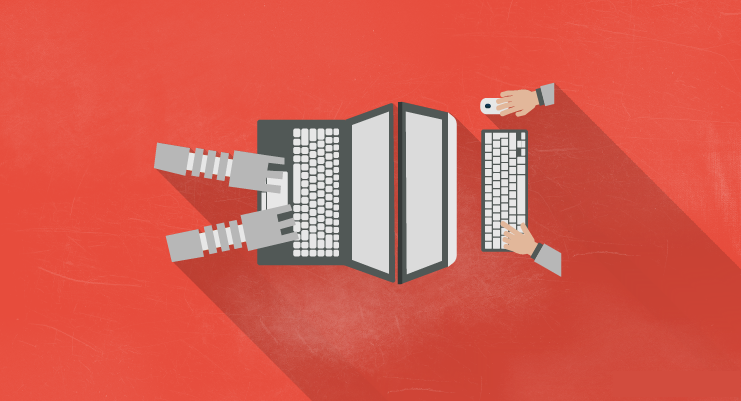 Even web designers have to accept the fact that smart machines and AI are gaining ground. It does not have to be as terrible as the aforementioned Gartner Study forecasted. Still, in the medium/long term, we must anticipate the fact that the preparation and provision of websites will change dramatically. The American Startup The Grid is just the first, currently very visible indication that the role and the tasks of web designers will change in the future. And regardless of The Grid’s success, its concepts will most definitely be taken up, developed, refined, and improved elsewhere. Published on 11/22/2016 by Bela Mutschler.